Here is a link to the VMworld session I will be presenting with Brocade. The session is based on the project I am currently engaged on for a State of California agency. I look forward to seeing you at the session! #VMworld #NET6256SPO Advanced Network Architecture in SDDC to deploy highly automated IT Service Delivery based on NSX. 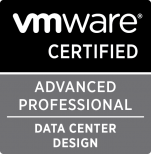 I am parking this here as a reference for an upcoming customer design/deployment of vCenter 6. This article has good information on the specific requirements for load balancing the various vCenter SSO versions. VMware KB: vCenter Single Sign-On and Platform Services Controller High Availability Compatibility Matrix. VMware KB: Backing up and restoring the vCenter Server Appliance vPostgres database. This is very useful information for anyone who is considering deploying the vCenter 6.0 virtual appliance.